Alderac Entertainment Group | Kris Johnson's Blog…sort of. 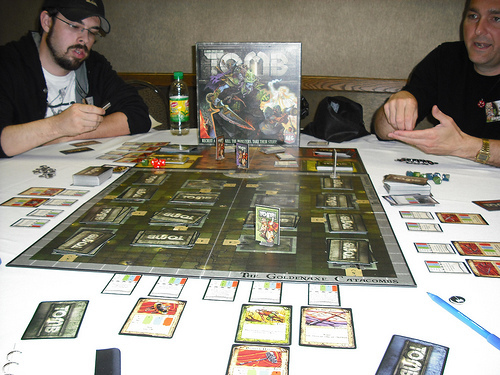 Tomb is a board game in which each player recruits a party of stalwart adventurers from the Troll’s Head Inn and sends them to explore crypts in The Goldenaxe Catacombs. The objective: kill monsters and get loot. I happened upon an impromptu demo run by Todd Rooks on Saturday afternoon on the third day of Con on the Cob. The game starts with players populating the crypts of The Goldenaxe Catacombs with a wide variety of Monsters, Traps and Treasure (Crypt cards, which are placed face down in the crypts). There are 16 crypts in the basic game, ((The flip side of the game board is The Tomb of the Overseers, a more advanced game featuring 22 crypts and more advanced rules.)) each of which can contain a specific number of Crypt cards; crypts close to the Inn can hold only 1 card each, while those in the far corners of The Goldenaxe Catacombs hold 5 cards. When Grim makes an Attack, he rolls 3 Green dice and 1 Blue die; when he makes a Holiness check, it is with 3 Blue dice and 1 red one. All dice in Tomb are 10-sided, and the color of a die indicates its chance to roll a success: ((Each die face is either blank or decorated with an axe; axes indicate success.)) Green dice have only a 30% success rate, Blue dice have a 50% success rate, and Red dice have a 70% success rate. Grim has a fairly puny Attack, which is the domain of the Fighter class; his Skill (the primary stat of the Rogue class) and Magic (important to the Wizard class) are both nonexistent, and his Holiness (as one might expect from a Cleric) isn’t too shabby. Grim also grants each character in the Party an additional Blue die to all of their rolls for each Wound they have. This was an ability that I completely failed to remember during the game, which undoubtedly made things a bit more difficult for Ichaerus, The Iron Duke (a Fighter), Ricart Darpor (a Rogue) and Sir Aleron D’Ilchant (another Fighter). These five characters comprised my party for much of the game, but I managed to stumble on a bit of luck early on and my party was pretty stable. The three gentlemen I was playing with weren’t so fortunate, and as a result the four of us managed to get at least 16 recruited characters killed over the course of about two hours. As long as a player has at least one character in his party (maximum party size is five), he may enter the tomb and begin exploring crypts. When a party enters a crypt, a symbol in the entrance indicates which player becomes the Crypt Master. The Crypt Master picks up all of the cards in the crypt, announces whether there are any Traps to disarm, and controls any Monsters. In the event that the crypt contains only Treasure cards, they are immediately given to the player whose party entered the crypt. Each Trap, Monster and Treasure card has an XP (experience point) value, occasionally zero; successfully disarmed Traps and defeated Monsters go into a players Bank, and Treasure looted from crypts can also be banked, though players have the option of equipping their characters with any Treasure they loot. Banked XP is (for the most part) safe; equipped Treasure, on the other hand, is lost (along with its XP) if the character to which it is attached is killed. Equipped Treasure may also be pickpocketed by Rogues from other parties, though the consequences of failing a pickpocket attempt can be severe (up to and including the death of the pickpocketer). During his turn, the actions available to a player depend on where his party is currently located. In the Inn, players may recruit additional characters to the party or draw two Inn cards. There are four types of Inn cards: Items, Spells, Prayers and Tactics. To be eligible to draw Spell or Prayer cards, at least one character in the party must have dice in Magic or Holiness, respectively. ((Additionally, a player must discard all of his Spell cards if his last character with dice in Magic dies. Ditto for Prayer cards and Holiness.)) There is no hand limit, but Inn cards have no XP value, so eventually the party will have to venture out of the Inn. 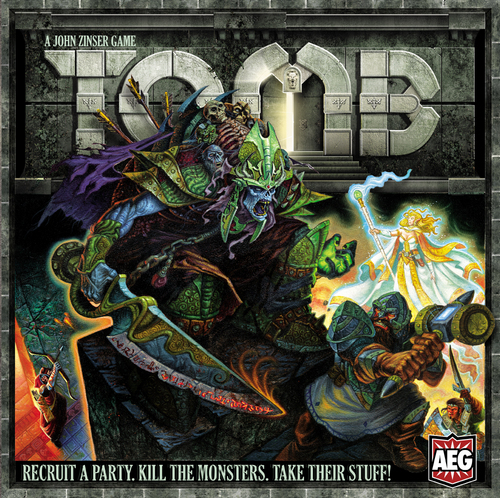 In the Tomb, a party may move, pickpocket, or enter a crypt (normally, a party may not move and enter a crypt in the same turn). Apart from the standard Inn and Tomb actions, it is also possible to cast Spells or Prayers or use Tactics, provided the card allows it. One card, for example, allowed me to immediately return to the Inn and recruit two new characters; assuming I was in the Tomb, this would normally take three turns: one turn to return to the Inn (which can be accomplished in a single turn, regardless of distance), a second turn to recruit the first character and a third turn to recruit the second character. While some Spells, Prayers and Tactics are used in place of a normal turn, others can be used to react to something another player has just done. These cards can be played outside of a player’s turn, but do not otherwise affect the turn order. In one case, after an opponent’s Rogue had failed to pickpocket my Rogue (and, thus, was killed), I used a React to immediately recruit him into my party. When the final crypt has been opened and all Crypt cards have been removed from the Tomb, the game is over and the player with the most XP wins. Despite a very lucky start, the ability to move around the Tomb more than twice as fast as most of the other players and some sneaky tactics that made it difficult for any party but my own to enter the final crypt, I still managed to fumble and lose the game by 10 points. My downfall was brought about by two things: first, a monster that forced every character in my party to make a Skill, Magic or Holiness check before battle began; a failed roll meant death, and four of my five characters either failed the check or were killed in the ensuing battle. The second component in my defeat was a decision to retrieve two monsters from my XP Bank to fight for me in the final battle. The monsters were worth a total of 13 XP and both were killed in the course of battle. That thirteen point loss more than accounted for my ten point deficit at the end of the game. 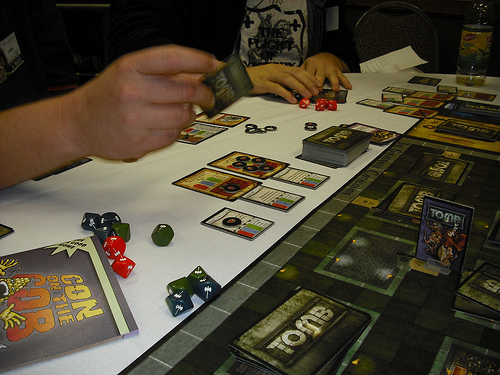 Had my convention budget been larger by about fifty dollars, I would have done what one of the other players at the table did: run immediately to the dealer room and purchase a copy of Tomb. The game was a lot of fun and, despite a minor rules snafu, ran very smoothly. I’d play it again in a heartbeat, and I’m very curious about The Tomb of the Overseers side of the board as well as the campaign play Todd mentioned.